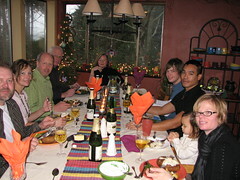 On New Years we had the pleasure of hosting some guests for Norway. Esther's cousin Touren and her husband Fedrick and son Barent are in the states visiting their daughter Anna and family who live in Tacoma. Esther's brothers and families were also here, which made for a very full and merry household. On Wednesday, eight of us went snowboarding at Crystal where we experienced massive powder and snow all day. The ladies stayed home and enjoyed a day of leisure and shopping.